How to Select the Best Electric Jawsaw? Although there’s a very small range of top rated electric powered jawsaws for sale, that doesn’t mean you shouldn’t put effort into choosing the best electric jawsaw for the money. Those that are available for sale on the market need to be able to meet the mark as reliable, durable and cost effective. Within this buying guide we aim to show you a selection of electric jawsaws with varying features to help you make your decision. Each brand offers different pros and cons, and can ultimately help you choose the correct product for your circumstances. Electric jawsaws have a very targeted market. They are best suited to residential environments or those properties with small limbs needing to be cut. They are also the perfect addition to the tool shed for those who aren’t confident handling a high powered chainsaw. As with any outdoor power tool, you should take care to avoid injury. Even though an electric jawsaw is less powerful than a chainsaw, it still has a bar and chain capable of ripping through skin and causing serious damage. This means it’s still recommended you wear safety equipment such as steel-toe boots, gloves, glasses and even chaps. Why take risks when you don’t have to? In order to purchase the most efficient electric jawsaw, you should pay careful attention to its engine rating. The voltage and wattage really do make a difference, as does the gauge of the extension cord you’re using to run the jawsaw. The longer the extension cord, the less power your jawsaw will have. It also pays to remember that jawsaws are effective in very few professional settings. Arborists may carry a jawsaw to cut those small, hanging logs, but keep in mind they are not a commercial grade power tool. Using them beyond their means can greatly reduce their efficiency. While most features vary from one electric jawsaw to the next, several remain consistent across several makes, models and manufacturers. Many have enclosed bars and chains for a layer of protection, as well as shaped teeth for increased grip and stability. The blade housing is also designed to cut safely from the ground level, and many even have automatic oiling systems and level indicators. Before you make your decision, review each product and its feature list carefully in order to make sure you’re getting the best electric jawsaw for the money. Being electric, minimal maintenance is required. You will need to keep the oil levels topped up, the machine clean and the chain sharpened, but you can store it away with confidence. There’s no worrying about servicing, fuelling or even spark plugs. Simply plug it in, or insert the battery, and use it to your heart’s content. In comparison to the cost of a standard chainsaw, a jawsaw is very affordable. You can often get the best deal when you buy online, on websites such as Amazon. Just remember that the cheapest option is not always the best option. The best electric jawsaw for the money is one that can provide top rated features at a good cost to the consumer. In comparison to its motor size, it’s very powerful. It has a heavy duty cutting bar and chain that cuts through thick branches and logs. It’s priced very affordably on the market. It has an automatic tension adjuster. It becomes clogged easily with small wood chips. Some parts appear to be poorly made and fall apart. The durability is not that good. Dimensions: 25.2 x 8.12 x 9.37 inches. QWhat kind of motor does it have? QWhat gauge does the extension cord need to be? AIf it’s between 51-100 feet, it needs to be 16 gauge. QWhat outlet does it need to be plugged into? While it’s priced competitively on the market and works well on small branches, many users note there are major problems with durability. Parts have been known to come loose, and many components can break with minimal pressure. It’s hard to know how much of this is due to poor operation, or whether the parts really aren’t made to last. However, in saying that, for most people it does the job it says it will do. It cuts through logs of up to 4 inches in diameter, and the chain stays sharp for a surprisingly long time. Check out what other people who purchased this product think about it. Read Black+Decker LP1000 electric jawsaw reviews. It comes with an extension handle to get into hard-to-reach places. It can cut limbs up to 12 feet high in the air. It has an enclosed jaw guard to reduce the risk of injury. It comes with a generous 3 year warranty. It has an auto-tensioner to reduce the risk of the chain falling off. The pole isn’t stable to use. Some of the components don’t fit well together. The chain comes off easily – even with the auto-tension feature. Dimensions: 61 x 10.6 x 9.6 inches. QWhat motor does it have? QWhat is the longest electric cord that can be used? AClean and drain the oil, sharpen the chain and clean the jawsaw for storage. If you’re looking to undertake occasional maintenance around home but you don’t require anything too heavy or powerful, this WORX WG308 jawsaw is a good option. Although it’s not well balanced on the extendable pole, it does cut through limbs 4 inches or less with relative ease. It’s also easy to maintain, is lightweight, and is affordable for a range of users. It can easily be considered one of the best electric jawsaws for the money. Check out what other people who purchased this product think about it. Read WORX WG308 electric jawsaw reviews. It comes with plenty of accessories for maintenance and general use. The blade and chain are enclosed within a guard to reduce the risk of serious injury. It has an automatic tensioner. It’s quite affordable for a range of users. It’s quite heavy in comparison to some other models on the market. You are limited to where you can use it due to its 100 foot cord maximum length. Dimensions: 61 x 11 x 9.5 inches. QCan the jaw be adjusted? Not all limbs are easily accessible or are facing in convenient directions for cutting. This is why the WORX jawsaw is so popular. Not only can it cut branches of up to 4 inches in diameter, but it can cut at any angle you require it to. This is a very good feature and one that is appreciated by many customers. It’s also priced well on the market, is preassembled and is top rated for customer peace of mind. It’s easily one of the best electric jawsaws for the money. Check out what other people who purchased this product think about it. 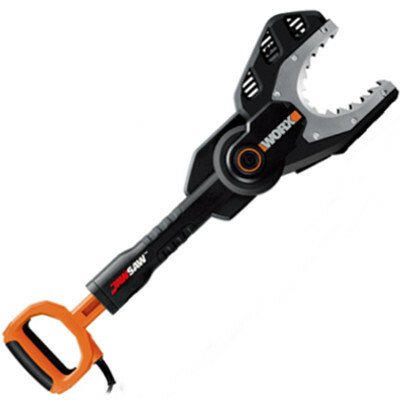 Read WORX WG307 electric jawsaw reviews. You can choose to buy it with or without the battery and charger. It’s not limited in its reach by a cord. It has an auto-tension feature. The chain is oiled automatically. The scissor cut action reduces the risk of kickback you get from a standard chainsaw. It comes with plenty of accessories for maintenance and use. Its cut capacity is less than other models on the market. The charger doesn’t charge the battery very well. The chain is known to come off quite easily – meaning the auto-tensioning function isn’t very good. It needs to be drained before being stored as it leaks oil. 3.4 oz bottle of chain oil. Dimensions: 20.6 x 14.6 x 8.1 inches. QWhat kind of battery does it come with? QWhat is the battery life? QIs the battery interchangeable with other WORX products? While this WORX jawsaw can be considered more convenient than a corded jawsaw due to not having to worry about cords, it has some major faults. The charger is poor, some components are poorly made and the chain is known to fall off quite a lot. It also leaks oil which means you need to drain it before storing it. Other models for sale also have a 4 inch capacity, whereas this model only has a 3.5 inch capacity. For all its failings though, many users have been pleased with how powerful it is, and how easy it is to cut through branches. It’s also exceptionally well priced on the market in comparison to the many features and accessories. Check out what other people who purchased this product think about it. Read WORX WG320 electric jawsaw reviews. Where to Buy Electric Jawsaws? When you’re looking to get the best deal but you don’t want to sacrifice quality to get it, the best place to shop is online. Although physical stores provide the same variety, websites such as Amazon are highly convenient and have a variety of cost effective options for residential users and professionals alike.